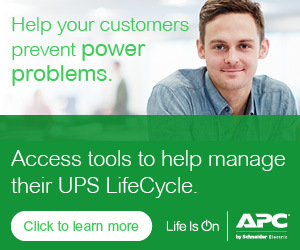 APC by Schneider Electric partners that target managed service providers and larger enterprises now have access to a new switched rack power distribution unit (PDU) as a way to help these organizations deal with ever greater densities of IT gear and to better manage it all. The new 60-amp switched rack PDU is the latest and by far the most powerful in the switched PDU line, which previously maxed out at 30 amps. The increase in power alone should garner attention, and may also serve as a way to get into a discussion about the benefits of switched PDUs in general. A switched rack PDU gives MSPs and enterprises new levels of visibility and management capabilities for attached IT equipment. IT staff can connect to the PDUs remotely, enabling them to monitor and manage IT equipment, be alerted to potential problems before they occur and take corrective action to prevent IT overloads. Such capabilities are critical in today’s highly distributed IT networks and hybrid public/private cloud computing environments, where IT loads exist in various locations. Remote outlet level controls to allow on/off power cycling, to remotely reboot equipment and restrict unauthorized use of individual outlets. Power sequencing time delays to allow users to define the order in which to power up or down attached equipment to avoid circuit overload. Current metering for real-time remote monitoring of connected loads with user-defined alarms to warn of potential circuit overloads. Power monitoring, a temperature/humidity sensor port, and locking IEC receptacles. Auto-notification of issues, based on thresholds tied to customer requirements or service level agreements, to help more quickly resolve issues remotely before they cause downtime – thus improving customer satisfaction. Integration with data center infrastructure management (DCIM) tools including Schneider Electric StruxureWare for Data Centers. On top of all the management capabilities switched PDUs bring, the increased capacity of the new model will be a welcome development among customers because data center and edge compute environments are becoming increasingly dense. Traditionally an IT rack might draw 2-5kW of power and 10-30 amp circuits would be more than adequate to handle the current flow. But with the deployment of blade servers and converged infrastructure an IT rack may now carry as much as 15kW, requiring circuits to handle anywhere from 40-60 amps of current. That’s no problem for the AP8000 series Switched Rack PDUs, with capacity of up to 60 amps. As explained in this previous post, the program applies to deals of any size, with no revenue minimum, and offers discounts that grow depending on how many product categories the deal includes. For example, a deal that includes three product categories gets a 7% discount while one with five categories gets 12%. Click here to learn more about our Switched Rack PDUs and start perfecting your pitch for MPS and enterprise customers.